It’s very risky to trust the promises made by politicians. But at least there’s a potential downside when they break their word. President George H.W. Bush lost the 1992 election, for instances, after violating his read-my-lips, no-tax-hike promise. So I think it’s useful to get politicians to explicitly commit to good policies, such as the no-tax-increase pledge. But what about getting language in a party platform? Is that a vehicle for getting good policy, or at least is it a way of blocking bad policy? For the most part, I don’t think party platforms bind politicians or constrain their behavior. To be sure, I’m happy when platforms embrace policies that I like, but I’m not foolish enough to think that this automatically will translate into better policy after politicians get elected. For the most part, platforms are a way for politicians to appease the more philosophically inclined people in their parties. So the Democratic platform is generally farther to the left than Democratic politicians and the GOP platform is generally farther to the right than Republican politicians. With these caveats taken care of, let’s review the proposals and policies in the Democratic platform (I’ll assess the Republican platform tomorrow). I’ve excerpted the items that are noteworthy and I follow each item with a brief observation. Democrats will expand Social Security…[and] will achieve this goal by taxing some of the income of people above $250,000. This is like stepping on the accelerator while approaching a cliff. In inflation-adjusted dollars, the program’s unfunded liability is a staggering $37 trillion, yet Hillary and her friends want even more spending. And they want to compound the damage with a huge tax increase on investors, entrepreneurs and small-business owners. Democrats will also create an independent, national infrastructure bank. This is a recipe for cronyism that will further expand the federal government’s role into an area that should be reserved for states, local governments, and the private sector. Democrats will defend the Export-Import Bank. Bernie Sanders was good on this issue, so this platform language means Hillary Clinton’s support for corporate welfare prevailed. Democrats will provide direct federal funding for a range of local programs that will put young people to work and create new career opportunities. Since job-training programs have a long track-record of failure, too bad they didn’t suggest repealing job-killing minimum-wage laws. Democrats will not hesitate to use and expand existing authorities as well as empower regulators to downsize or break apart financial institutions when necessary to protect the public and safeguard financial stability, including new authorities to go after risky shadow-banking activities. Other than pointing out that big isn’t necessarily bad, I don’t really have any policy reaction. I’m only sharing this blurb since I imagine you’ll also laugh out loud at the platform’s implicit assertion that Hillary Clinton somehow will crack down on her friends and donors at Goldman-Sachs. Yeah, I’m sure that’s high on her list. Right after putting inner-city schoolkids before the teacher unions. We will ban golden parachutes for those taking government jobs. Will that rule apply retroactively to Treasury Secretary Jacob Lew? Democrats will claw back tax breaks for companies that ship jobs overseas, eliminate tax breaks for big oil and gas companies, and crack down on inversions and other methods companies use to dodge their tax responsibilities. There are no “tax breaks” for companies that invert. We will end deferrals so that American corporations pay United States taxes immediately on foreign profits and can no longer escape paying their fair share of U.S. taxes by stashing profits abroad. The “fair share” should be zero for income that is earned (and therefore already subject to tax) in other nations. We will ensure those at the top contribute to our country’s future by establishing a multimillionaire surtax to ensure millionaires and billionaires pay their fair share. Even the IRS admits the tax system is very biased against the so-called rich. …we will shut down the “private tax system” for those at the top, immediately close egregious loopholes like those enjoyed by hedge fund managers, restore fair taxation on multimillion dollar estates, and ensure millionaires can no longer pay a lower rate than their secretaries. Wow, endorsing higher capital gains taxes, higher death taxes, and dishonest math in one sentence fragment. We will work to crack down on tax evasion. Unfortunately, they want higher compliance by expanding the power of the IRS, not by lowering tax rates. …we will make sure that law-abiding Americans living abroad are not unfairly penalized by finding the right solutions for them to the requirements under the Foreign Account Tax Compliance Act (FATCA) and Report of Foreign Bank and Financial Accounts (FBAR). This language is vacuous, but it’s nonetheless noteworthy that even the Democrats feel compelled to say bad things about one of Obama’s worst laws. Democrats believe it is long past time to close this racial wealth gap. Disparities in wealth cannot be solved by the free market alone, but instead, the federal government must play a role in eliminating systemic barriers to wealth accumulation for different racial groups and improving opportunities for people from all racial and ethnic backgrounds to build wealth. More vacuous language, though it’s disappointing that the platform doesn’t endorse personal retirement accounts, which would fix one of the ways minorities are hurt by government policy. We believe that the states should be laboratories of democracy on the issue of marijuana, and those states that want to decriminalize it or provide access to medical marijuana should be able to do so. Easily the most pro-liberty part of the Democratic platform. Democrats will develop a national strategy, coordinated across all levels of government, to combat poverty. We will direct more federal resources to lifting up communities that have been left out and left behind. 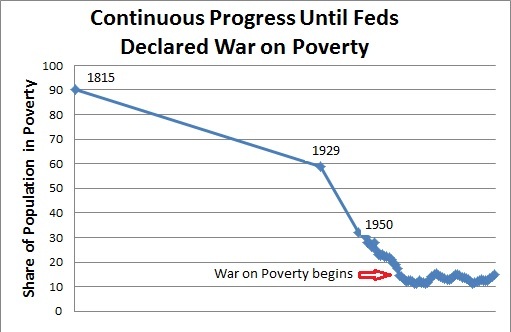 Anyone think this will work any better than all the other failed anti-poverty schemes from Washington? I didn’t think so. Democrats will protect proven programs like the Supplemental Nutrition Assistance Program (SNAP)—our nation’s most important anti-hunger program—that help struggling families put food on the table. The only thing “proven” about the food stamp program is that it’s riddled with fraud and it creates dependency. We will dramatically increase federal infrastructure funding for our cities. It’s not the role of the federal government to pave roads and and build bridges and corrupt big-city political machines shouldn’t be offloading their responsibilities onto taxpayers in the rest of the country. We will continue to support public funding for the National Endowment for the Arts, for the National Endowment for the Humanities, and for programs providing art and music education in primary and secondary schools. If I want to listen to cowboy poetry, I should pay for it myself. We believe America must be running entirely on clean energy by mid-century. We will take bold steps to slash carbon pollution. Mostly vacuous rhetoric, but it could lead to “bold steps” to undermine prosperity. Democrats believe that carbon dioxide, methane, and other greenhouse gases should be priced to reflect their negative externalities, and to accelerate the transition to a clean energy economy and help meet our climate goals. You don’t have to read between the lines to recognize that “should be priced” is DC-speak for a big energy tax. All corporations owe it to their shareholders to fully analyze and disclose the risks they face, including climate risk. Those who fail to do so should be held accountable. Democrats also respectfully request the Department of Justice to investigate allegations of corporate fraud on the part of fossil fuel companies accused of misleading shareholders and the public on the scientific reality of climate change. This is probably the most reprehensible part of the Democratic platform. America is not a banana republic and people shouldn’t be attacked with “lawfare” for disagreeing with the political establishment. Democrats are unified in their strong belief that every student should be able to go to college debt-free, and working families should not have to pay any tuition to go to public colleges and universities. A plan that unambiguously will increase the cost of college. Democrats believe that health care is a right, not a privilege, and our health care system should put people before profits. …Americans should be able to access public coverage through a public option, and those over 55 should be able to opt in to Medicare. For those who think the Obamacare boondoggle didn’t go far enough. Democrats will fight any attempts by Republicans in Congress to privatize, voucherize, or “phase out” Medicare as we know it. And we will oppose Republican plans to slash funding and block grant Medicaid and SNAP. Let’s bury our heads in the sand and pretend there’s no entitlement crisis. A powerful role is not the same as a productive role or positive role. Though the United Nations is mostly feckless. The real damage is caused by the International Monetary Fund and the Organization for Economic Cooperation and Development. I could analyze additional planks, but there’s a limit to have much statist claptrap I can endure. If I had to give a grade to the Democratic platform, it would be “L” for leftist. Just like the Party’s nominee.